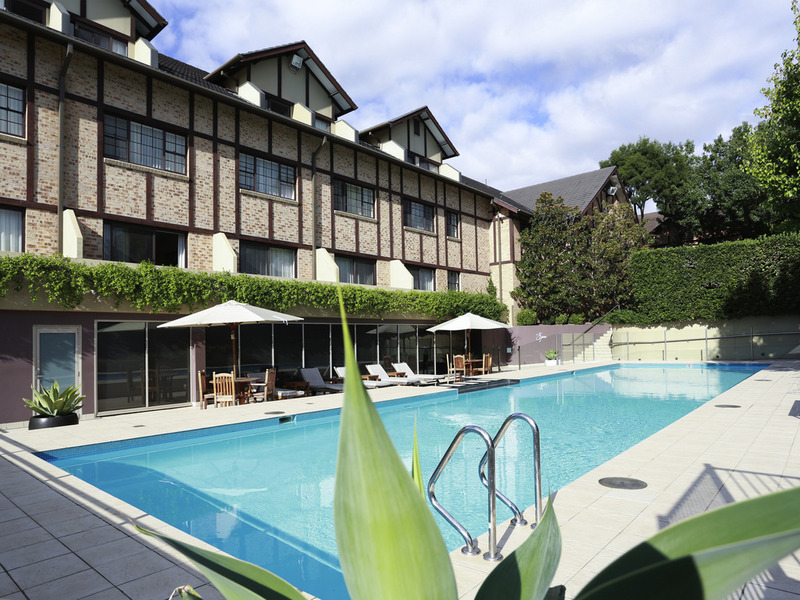 Grand Mercure The Hills Lodge is a classic Tudor style building set in beautifully landscaped gardens, just a 30 minutes drive from the centre of Sydney. Conveniently located near the Norwest Business Park, the lodge features 97 rooms, a restaurant, bar, heated swimming pool, steam room, day spa and four function rooms for up to 200 delegates. Adjacent to The Hills Lodge is a recreational centre which includes a health club, indoor rock climbing, ten pin bowling, a childrens playground and cafe. Grand Mecure Hills Lodge, is conveniently located in the heart of Sydneys North West, in Castle Hill. Access is via the M2 from the city and the airport, situated opposite Norwest Business Park & a short drive will take you to two major shopping centres! We offer a variety of rooms starting with our Deluxe & Twin Share, with Disabled access rooms. We also have some self contained Suites, as well as several Superior Rooms & Suites. Chef Ryan Goetzke has designed a menu to cater for everyone including fine a la carte dining as well as something for regular travellers who feel like something more relaxed. Adjacent to the restaurant, Nobles Bar features a beautiful outdoor courtyard. But I am a little forgetful, the room cleaner probably shifted my things from place A to place B, that I didn't find it while checking out and I missed it in the room. I really liked the hotel. The bar, restaurant and facilities were well laid out. The room was clean but a bit dated. The breakfast had some good and some bad notes. Easy to check in and out. Things run very smoothly and nothing seems to be much of an issue for staff. The welcome and courtesy of the hotel reception set the time for a most enjoyable (but way too short) stay. The recognition of Silver Membership with Accor was appreciated. We ate at the restaurant for dinner and breakfast. The staff were most courteous and the food was good. A nice bottle of wine accompanied our meal. The room was very clean and comfortable. The only adverse observations that I would make concerns the carpet appears to be a bit tired and there were numerous chips off timber and other areas that needed painting. However it is a hotel and that has to be expected as a work in process. All in all a very enjoyable stay. It was very nice and clean. However, it would be nice if the breakfast sign was somewhere very obvious, and told of before check in, because we only found out about it the morning of check out unfortunately. Room was comfortable and close to reception which I liked considering i checked around midnight. The only reseaon I changed my booking to this hotel was the fact Novotel changed to Rydges at Baulkham Hills. I stay each week. I do have another booking and will try again however timing in the morning is vital to any traveller. I was very disappointed in the room service for breakfast with everyday being late. I requested the first timeslot of the day 6:15 - 6:30 with a preferred on the card nominated 6:30, i had to call one morning at 6:45 to ask. I only ordered toast and furit so not as if I had to wait for a cooked breakfast. the toast was that dark I had to leave it. Last day I nominated the same time with a preferred time of 6:20 hoping that would improve. Upon checkout I tried to advise reception and I did have one very engaged team member when another gentleman took over and did not engage with me at all and was not interested in the iisue. From a sustainibility point of view you could also save some $$$ if you considered how much unnescessary alfoil and plastic wrap is being used in room service. Small issue from a personal point of view only and would be a cost saving to your business. Pleasant, helpful staff as always. Overall pleasant. The false evacuation at 10pm was alarming and we could not get a place for dinner in the restaurant. The car park was also full at night and we had to park in the car park near by. I thought the food was overpriced but all staff were lovely and the bed/shower were great. I was much better than expected. The care and service from the staff was great! Darlene and all the staff at hills lodge were amazing ! Food, service , rooms , second to none.. very much looking forward to nobles hosting my bridal shower in July , Mother's Day lunch , And myself and my girls staying the night before, getting ready and departing from hills lodge on my wedding day . Special thanks to Darlene for making everything so special for me and even ensuring she will be on for my big day! I love hills lodge .. laura s.
John and the two ladies assisting him at Nobles did a wonderful job and were a credit to the restaurant. Very pleasant receptionist on our arrival. Very nice hotel, beds were comfortable and great pillows which pleased my husband. Breakfast was delicious especially the pancakes. nice coffee as well. Grand Mecure the Hills Lodge provides friendliness, comfort, convenience and and a feeling of elegance. Staff at Reception are always willing to help and the Restaurant is superb. Facilities of undercover parking are available, a spa and gym are available for use and the rooms provide all the necessary comforts away from home, including wonderful beds.